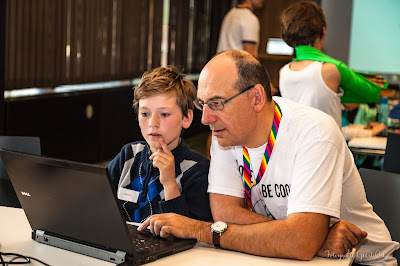 By Maarten Magits, volunteer at CoderDojo Klein-Brabant and youngest member (17) of the Belgian delegation. Friday the 19th of October, I had that date noted in my calendar for quite a while. Together with 14 other volunteers, I was part of the Belgian delegation at the global DojoCon2018 in Kilkenny, Ireland. Due to unforeseen circumstances (read as: car rental issues, driving on the left, etc. ), we missed the opening and introduction on Friday night but that gave us the opportunity to have a good night of sleep to prepare for all the sessions, discussions and lectures on Saturday. Saturday morning, after a quick breakfast, we headed to the Newpark Hotel where DojoCon2018 would take place. Every visitor/delegate got a usb to lightning cable and a goodie bag upon registering to the venue and had the opportunity to check out the different information stands filled with even more brochures and goodies. At 10 o’clock the opening speech started and both the people from CoderDojo Kilkenny and the CoderDojo Foundation took the stage to welcome everyone and give out the general information about the further development of the day. They also talked about the changes that are happening / have happened to the global CoderDojo platform. Afterwards, an 18 year old entrepreneur took over and taught us all about the importance of the new generation and about how he wants to redefine the word entrepreneur. After his speech, the actual sessions, discussions and lectures started. There were 32 different sessions to attend from “how to build an APP” to “starting and maintaining a dojo”. Throughout the day, our group split up to attend as many sessions as possible which gave us the opportunity to talk about the sessions we attended over lunch and dinner. I hope to see you in Kortrijk!